Congress: On July 26, the state legislature passed H 3992, which was signed on August 1, and precleared by the DoJ on October 28; on March 9, 2012, court challenges to the plan were rejected. State leg. : On June 22, the state legislature passed S 815 (state Senate lines) and H 3991 (state House lines); both bills were signed on June 28, 2011. The state House plan was sent for preclearance to both the DoJ and federal court in Washington, DC, and precleared by the DoJ on October 11. The state Senate plan was also submitted to both the DoJ and federal court., and was precleared on November 14. South Carolina's congressional and state legislative lines are both drawn by the state legislature, as a regular statute, subject to gubernatorial veto. The members of the state House committee with responsibility for redistricting are listed here; the members of the state Senate committee are listed here. Census data were delivered to South Carolina on March 23, 2011. South Carolina state law does not impose a particular deadline for drawing congressional or state legislative lines, though candidates must file for congressional and state legislative primary elections by March 30, 2012. [S.C. Code § 7-11-5] The regular legislative session began on January 11, 2011, and ended June 2, 2011. Public hearings were scheduled for March and April 2011, and the public was invited to submit comments and plans, at least to the state Senate, through May 9, 2011. Transcripts and public comments can be found here and here. Like all states, South Carolina must comply with constitutional equal population requirements. South Carolina must also, like all states, abide by section 2 of the Voting Rights Act. Furthermore, because South Carolina is considered a "covered jurisdiction" under section 5 of the Voting Rights Act, it has an obligation to submit redistricting plans to the Department of Justice or to the U.S. District Court for the District of Columbia, to ensure that the plans do not discriminate against minority communities. Harrell v. Holder, No. 1:11-CV-01454 (D.D.C. ): an action in federal court requesting preclearance of South Carolina's state House districts. - Complaint (Aug. 9, 2011). The latest: After the plan was precleared on October 11, plaintiffs dismissed the complaint on October 13. Harrell v. Holder II, No. 1:11-CV-01566 (D.D.C. 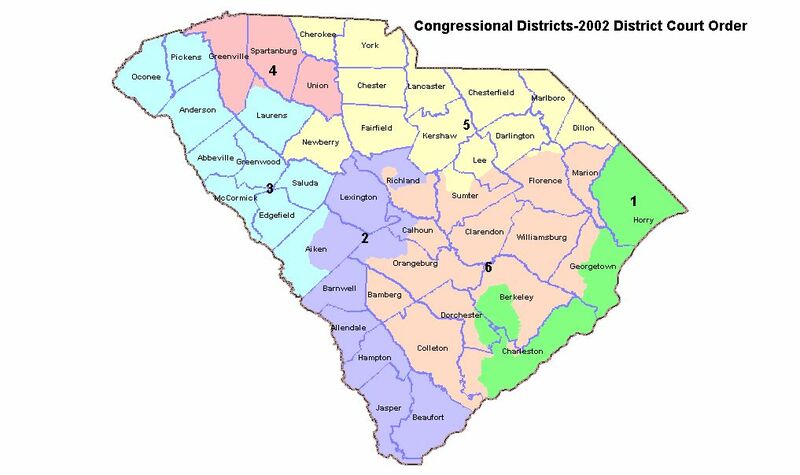 ): an action in federal court requesting preclearance of South Carolina's congressional districts. - Preclearance submission to DoJ. - Complaint (Aug. 30, 2011). The latest: After the plan was precleared on October 28, plaintiffs dismissed the complaint on October 31. McConnell v. United States, No. 1:11-CV-01794 (D.D.C. 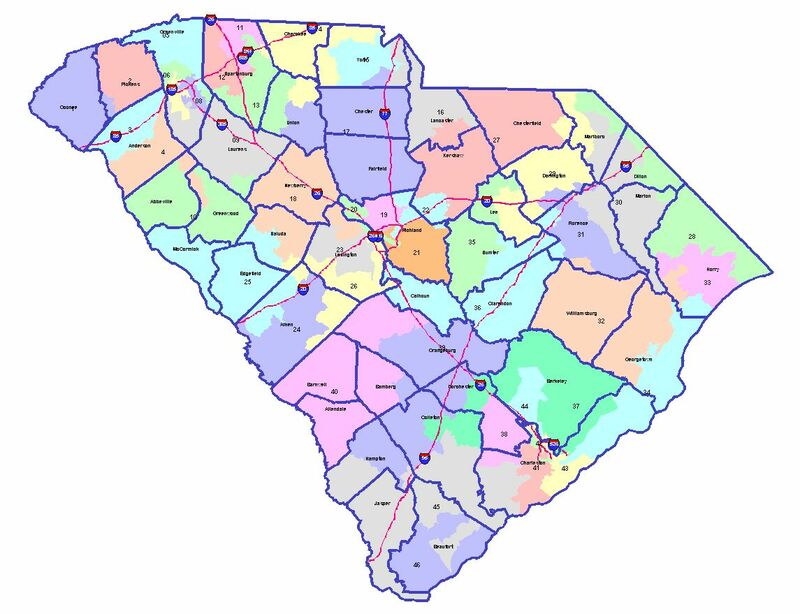 ): an action in federal court requesting preclearance of South Carolina's state Senate districts. - Complaint (Oct. 7, 2011). The latest: After the plan was precleared on November 14, plaintiffs dismissed the complaint on November 15. Backus v. South Carolina, No. 3:11-cv-03120 (D.S.C. ), No. 11-1404 & No. 13-1461 (Sup. Ct.): an action in federal court challenging the state legislative and congressional districts, based on alleged unlawful racial gerrymandering and a violation of the Voting Rights Act. - Complaint (Nov. 11, 2011) and amended complaint (Nov. 23). - Intervenors' complaint (Feb. 9), dismissed (Feb. 15). House Speaker, Sen. Pres., Elections Comm'n, House Comms. (Dec. 19). - Replies by Gov. et al., House members, Sen. Pres. (Jan. 4). - Deft. 's motion for summ. judgment (Senate) (Jan. 17), denied as moot (Feb. 15). - Opposition (Feb. 3), reply (Feb. 7). - Defendant's motion for summary judgment (House, Congress) (Feb. 13). - Plaintiffs' response clarifying claims and districts at issue (Jan. 26). - Final memoranda by plaintiffs, Sen. Pres., House Speaker (Mar. 5). - Opinion rejecting challenge (Mar. 9). - Jurisdictional statement (May 18). - Motion to dismiss or affirm (July 20), reply (Aug. 10). - Summary affirmance (Oct. 1). - Motion for relief from order (Aug. 29, 2013). - Response by State (Sept. 16), Sen. Pres. (Sept. 13), reply (Sept. 26). - Response by House Speaker (Sept. 30), reply (Oct. 10). - Order denying motion for relief (Mar. 10, 2014). - Jurisdictional statement, app. (June 6). - Motion to dismiss or affirm (Aug. 8). - Order dismissing appeal for want of jurisdiction. (Oct. 6). The latest: The complaint was filed on November 11, and an amended complaint was filed on November 23; several motions to dismiss were filed on December 19. On January 19, the court dismissed the State, Governor, Lieutenant Governor, and legislative committee chairs from the case, but denied motions to dismiss by the Elections Commission, House Speaker, and Senate President. On March 9, the court rejected the remaining claims, and dismissed the case. On October 1, 2012, the U.S. Supreme Court summarily affirmed. On August 29, 2013, plaintiffs moved for relief from the dismissal in light of Shelby County v. Holder; that motion was denied by the trial court on Mar. 10, 2014, with an appeal summarily dismissed by the U.S. Supreme Court on October 6. The legislature then redrew the state legislative lines, through a plan that was signed on June 2, 2003, and precleared shortly thereafter.